We’ve said before that autumn is the ideal time to plant shrubs, perennials and trees, because the plants have the whole winter to establish, hedge planting should be done between October and April. So how about getting around to that hedge you’ve been promising yourself? Hedging plants are now available as bare-rooted or root-plug plants, which are often a lot cheaper than pot-grown specimens. 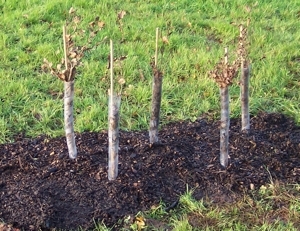 They may look a bit feeble, but plant now and they will be growing vigorously by spring! In deciding, think about where you want the hedge: is it shaded by the house or in full sun? Are there other plants competing? Do you want it to keep people out, or just provide a decorative edge to a path? All these affect your choice. The Woodland Trust recommends several small trees that are suitable as hedging plants, including holly, hazel, dogwood, hawthorn and dog rose. A mixture of these will give you green all year round from the holly, together with prickles to prevent anyone climbing through or over, winter colour from the dogwood stems and holly berries, spring blossom from the hawthorn, and flowers in summer from the dog rose. A mixed hedge will also provide a great environment for insects and small mammals and birds. Alternatively, you could use a single variety of shrub such as forsythia, lavender or pyracantha. Pyracantha is particularly good as it has prickles to prevent unwanted visitors, and year-round interest, since it is evergreen, and has both pretty white flowers in spring, and fiery berries in the autumn. You can buy trees and bushes from garden centres and by mail order. When they arrive, unpack them straight away, and if they’re dry, soak the roots in a bucket of water for at least 24 hours. Dig holes that are a few centimetres larger all round than your plant’s roots, and quite a bit deeper. As a rough guide, 30cm apart will result in a closely-planted hedge. It’s a good idea to put some well-rotted manure , manure compost or mushroom compost at the bottom of the hole (click here to see our range). You want to bury the root ball about 2.5cm below the level of the top of the soil, then firm down the soil. It’s also a good idea to mulch around the base of the tree, again with compost or bark chippings, to keep in the moisture. You won’t need to do much in the first year or so, except keep the mulch topped up, and water if there’s no rain for a week or more, especially in the first season. After that, cut back your hedge in late winter, before any birds are nesting, or at the recommended time for your chosen shrubs, to keep your hedge to the desired size.